For a convenient and often more economical solution to creating more work and office space, many people and businesses these days are having modular in plant offices created and built for them. An in plant office is a room or office that has been built off site then transferred assembled or unassembled to its new site to be used at a workplace or private dwelling. This way the distraction of the on site building process can be kept to a minimum with far less disruption to the workplace and staff. A prefabricated in-plant office provides a fast and cost effective resolution to your office space needs and demands. In plant offices are an easily accommodating addition to your family’s home or your noisy workplace, by transforming unused space into usable office space. In plant offices are customised and most usually come in a variety of appropriate colours and finishes to help enable the new room to blend in with the existing buildings or home furnishings. Because these buildings are manufactured off site they are easily built and assembled much quicker than the that it takes for traditional construction and without all the dust and clutter. These offices can remain permanently on site, but the beauty of them is that they are conveniently portable with the appropriate knowledge and capability. Panel built in plant offices are well constructed and durable, and are suitable for most locations providing a fully functional office space. These offices are constructed with customised or prefabricated pieces that are prepared then professionally assembled at the required location. These prefabricated pieces are fitted together and assembled without the need for heavy and excessive construction equipment, and time consuming measuring and remeasuring. The wall pieces are designed to fit together perfectly with built in tracks for phone lines and data cables as required by the customer. This means that the assembly is finished much quicker and with less waste and less mess and disruption. Panel built modular inplant offices can accommodate any space need. They are available in a selection of space requirements including one, two and three storey offices, and in a range of different colours and finishes. They provide a durable and lasting new area of office space in any type of building, and are designed to be fire proof, sound proof and cost effective. Also as mentioned earlier, they can be erected in a fraction of the time as normal manual construction, thus allowing regular work to resume quicker. Panel Built is a world class engineering company that provides and constructs modular building and modular office building installations. Their modular buildings are specifically designed for durability, easy installation and are known for their flexible designs. Their buildings are designed to provide a safe and quiet building or office, suitable for both staff and visitors to the premises. Panel Built pride themselves on having an ideal building solution for your requirements and available space, which will be planned together with input from the customer. 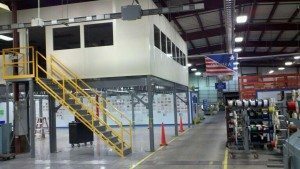 Modular in plant offices by panel built are the perfect way to accommodate your employees in a manufacturing or warehouse environment. The modular in plant offices that are designed by Panel Built appear clean and fresh, are well lit with natural light and are perfect for offices, staff rooms, break rooms, clean rooms, change rooms, store rooms, observation towers, equipment enclosures, security booths and literally for anything and everything that needs its own area and space. If you are needing a modular office in a hurry, Panel Built offer a quick two day service. This applies to a standard value line office, which are available in a limited range of colours and sizes and are of basic design. Modular office buildings are primarily available through the Panel Built Incorporated Company whose contact details can be found in the telephone book, online on their website or through their face book page. If you need to search further afield for other suppliers, you will find further details in the telephone book, or a quick search on the internet will provide you with further details and information regarding modular building by Panel Built.